What should you be doing the last couple of weeks leading up to your bar exam? Additional practice questions? Reviewing your lecture handouts and notes in your biggest opportunity areas? Review sample essay answers? Absolutely. Time is your most precious commodity. During the final days leading up to your exam, you need to spend it on areas that are going to make the biggest impact to your personal exam score, particularly on topics and subtopics where you may rank just below the 40th percentile or “the bubble”. All of this is a great plan and your BARBRI Personal Study Plan is going to continue to guide you right up until the exam. Even with this, many still feel anxious wondering if they’re focusing on the right things or spending enough time on the right areas of law. We’ve heard from students in the past that they felt just a little more comfortable walking into the bar exam after taking the supplemental one-day, eight-hour BARBRI Mini Review. 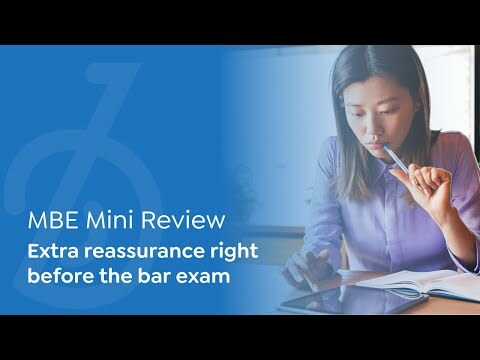 The BARBRI Mini Review is an online only lecture that covers, one last time, significant aspects of the topics most frequently tested on the Multistate portion of the bar exam. It provides just a little extra reassurance for students who feel that they’ll benefit from the extra work right before the bar exam. *Get the National Mini Review for $99 if purchased by Feb. 10th for the February bar exam or Jul. 10th for the July exam. Price is $129 after those dates. If you do not end up utilizing the supplemental BARBRI Mini Review after purchase, you may send a letter of withdrawal by March 15th for the February Exam or August 15 for the July Exam and your full payment will be refunded so there is no risk to purchase.